How would you like to get all the QUALIFIED help you need this season––and at a bargain basement price? It’s easy. All you have to do is turn your 2nd and 3rd year counselors into an “Army of Servants” just aching to work for you. How do you do it? 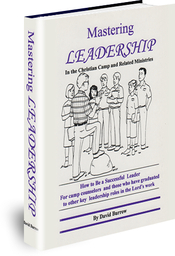 Get each of them a copy of Mastering Leadership in the Christian Camp and Related Ministries. This book condenses 12 years of research and over 30 years of leadership experience into one easy-to-read, easy-to-reference sourcebook that you and your counselors will use repeatedly. It reveals simple ways for you to get 2nd and 3rd year counselors to do tasks that only you could have done in the past. Mastering Leadership in the Christian Camp and Related Ministries is 166 value-packed pages of practical, down-to-earth, real, and workable how-to’s, tactics, strategies, styles, and techniques designed to turn your experienced staff into real leaders who can actually assume some of your heavy workload. How to lead in front of a group––without getting paranoid. Platform Manners––what they are and how to use them to command attention. How to prepare properly before making a presentation. How to use of body language to get and keep attention. How to “look like” a leader––in dress, manners, and speech. How to explain the “no personal contact” rule––without causing rebellion. How to teach a new game or activity––13 “for example” steps. How to lead songs––even if you don’t know music. How to “fake it”––when necessary. How to use song cards and overheads successfully. How to lead games––the easy way. Step-by-step planning for a successful game time. 6 different ways to divide teams into groups. How to lead a “sport” type activity. 6 proven principles to follow to ensure game time success. How to spend money like a leader. How to submit to authority like a leader. How a leader examines his/her spare time. How a leader responds to demands. 7 character traits of last-born children. It’s one that can be run by trainees. There are 18 easy-to-use chapters. Each chapter ends with a review and a soul-searching question-and-answer section (many questions are open-ended requiring thinking instead of repeating grocery lists). You can choose from over 73 questions and projects, which can be used for individual assignments or group discussion.